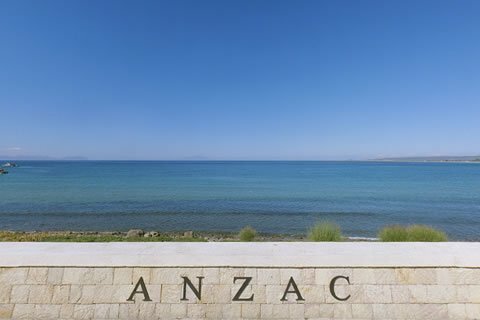 ANZAC Day at Gallipoli is an incredibly moving event which many Australians aspire to attend. It is, however, an extremely busy event that involves a lot of waiting, queuing, walking, exposure to the elements and going without sleep all night. There is no easy, comfortable way for the general public to attend the ANZAC Day Dawn Service at Gallipoli. The following information was kindly provided by our local supplier based in Canakkale, a local expert operating Gallipoli tours since 1989. It is essential reading for any potential visitors - What You Should Know BEFORE You Book! 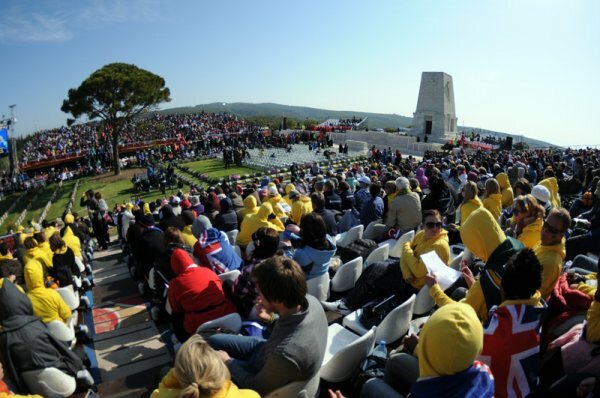 The ANZAC Day commemorative services are held within the Gallipoli Peninsula Historical National Park. There is no permanent infrastructure, with limited facilities available at the commemorative sites. All seating, lighting, and toilet facilities is brought in from outside the park for ANZAC Day. There is no shelter at any of the commemorative sites and visitors will be exposed to the weather for the entire period they are on site, which can be up to 16 hours. Large crowds, limited public amenities and traffic and security arrangements can result in long waiting periods, for entry and exit of the site. You should have a moderate level of fitness if you plan to attend the ANZAC Day commemorations. To attend the services you can expect to walk up to 8kms on uneven, uphill surfaces, including on very steep, graded dirt surfaces. Permanent toilets are only available at the Kabatepe Simulation Centre, which is some distance from the commemorative sites. Temporary chemical toilets and hand washing facilities are available on 24 and 25 April at the ANZAC Commemorative Site, Lone Pine and Chunuk Bair. The water at these locations is not suitable to be used as drinking water. There is no running water, power or lighting except for that in use for the services. Bottled water can be purchased from the Turkish food vendors at each of the commemorative service sites, but we encourage you to bring your own. Opened bottles of liquid will not be allowed onto the site, including open water bottles. Mobile phone coverage is available across the site. Temporary tiered seating is installed at the ANZAC Commemorative Site, Lone Pine and Chunuk Bair for the ANZAC Day services, reserved for the official party and people requiring mobility assistance. Seating will not be reserved for tour groups. As well as the tiered seating, there is limited grassed space available for seating. When the site opens, seating fills up quickly and can become quite crowded. Visitors should be considerate of others and not lie across seats in the tiered seating area. If the site reaches capacity, visitors seated in the grassed areas will be asked to stand during the Dawn Service. Large groups who arrive late may not be able to find room to be seated as a group and should be prepared to split up and stand if there are no more seats available. Visitors are asked to be respectful by not leaning against or have items touching any headstones in the commemorative sites. Visitors should also come prepared for the weather conditions. The weather during the day can get very hot and overnight very cold, with temperatures sometimes falling below 0 degrees Celsius. Rain and very cold winds are possible. Visitors should ensure they are adequately equipped for these extremes by ensuring that they take appropriate warm and protective clothing. It is important to remember that there is no shelter at any of the commemorative sites and visitors will be exposed to the elements for the duration of their stay. Wet weather and windproof jacket and pants; Warm, thermal clothing, jacket, beanie, hat or cap, gloves, scarf; Comfortable, sturdy walking shoes; Prescription medications (if required); Food/snacks. Drinking water (opened bottles will not be allowed into the site); Sunscreen; Torch; Camera and spare batteries; Insect repellent; A small daypack to carry these items in (large backpacks are not allowed). Local Turkish food and drink vendors sell limited quantities of their products within the Gallipoli Peninsula Historical National Park. You are encouraged to bring adequate food suitable for the period of 16 hours. Several kilometres from the ANZAC Commemorative Site coaches and their passengers are welcomed by a member of the visitor services team who issues each coach with a coach identification number. Each passenger will also receive an individual tag with their coach number on it. This will help visitors to indentify their coach at the end of the services. Coaches set down their passengers at Beach Cemetery, which is about one kilometre (15 minute walk) to the ANZAC Commemorative Site where the Dawn Service is held. All visitors will pass through a security screening point before entering the site, then walk approximately half a kilometre to the ceremonial area. When you disembark from your coach you must ensure that you have everything you will need for that evening and the following day, including food and medication, as you will not be reunited with your coach until the end of all of the commemorative services on the afternoon of 25 April. You will not be able to return to your coach if you have forgotten something or need to return items that are prohibited on site. 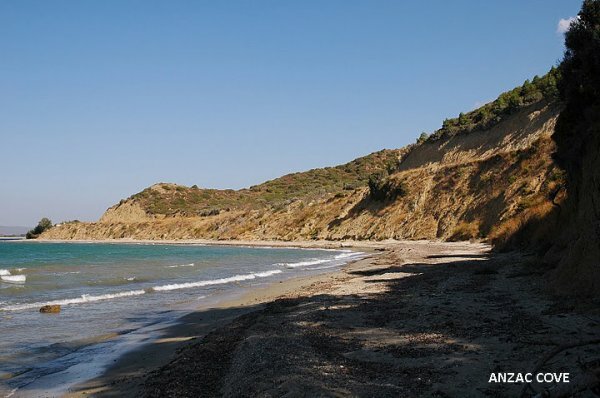 Access to ANZAC Cove will be restricted to those ticket holders won in the ballot. Further details about the 2015 will be released by the Australian and Turkish governments in due course. Those attending the Dawn Service at the ANZAC Commemorative Site can also attend the Australian Service at Lone Pine and/or the New Zealand Service at Chunuk Bair. However, due to the walking distance between the commemorative sites, and the timing of these services, it may not be possible to attend all services on 25 April. All visitors are provided with an information kit which includes the program and other information on entry to the site. Dawn Service to Lone Pine - After the Dawn Service concludes, at approximately 6.30am, visitors walk along ANZAC Cove Road and up Artillery Road to the Lone Pine Cemetery for the 10am Australian Memorial Service. This walk takes visitors past Ari Burnu, Shrapnel Valley and Beach Cemeteries. Shortly after Beach Cemetery, the route follows Artillery Road inland and slopes uphill past Shell Green Cemetery to Lone Pine. The walk from ANZAC Commemorative Site to Lone Pine is approximately 3.1 kms. It takes approximately 45 minutes to walk. The walk to Lone Pine is very steep, on graded dirt and uneven surfaces, and can be challenging to walk..
Lone Pine to Chunuk Bair - The New Zealand Service at Chunuk Bair commences at 11.30am. The route from Lone Pine to Chunuk Bair slopes uphill past the Turkish 57th Regiment Memorial. The walk from Lone Pine to Chunuk Bair is approximately 3.2 kms and takes approximately one hour and fifteen minutes to walk. The walk to Chunuk Bair is uphill on a bitumen road and can be challenging to walk. Following the conclusion of the Chunuk Bair Service at 12.15pm, coaches will begin arriving at Lone Pine Cemetery and will then proceed to Chunuk Bair to collect visitors, and visitors can expect to leave the site by mid to late afternoon on 25 April. It can take several hours for all coaches to collect visitors. Coaches will not arrive in the order in which they are registered.